Replaces heavy lead acid batteries. Only 29kg compared to 180kg! replace your standard heavy lead acid batteries on any* Double seater electric golf buggy. The battery weighs just under 30kg, saving almost 100kg when compared to the lead acid equivalent. This prevents fatigue on the buggy and more importantly extended revenue as it allows for the buggy to work longer in to the winter months, when double buggies using lead acid batteries would experience a buggy ban. Life expectancy of Lithium batteries is significantly longer than lead acid equivalent. Charges in a fraction of the time, with no drop of current during use. In other words will continue to perform at maximum output throughout the course without any drop in power. 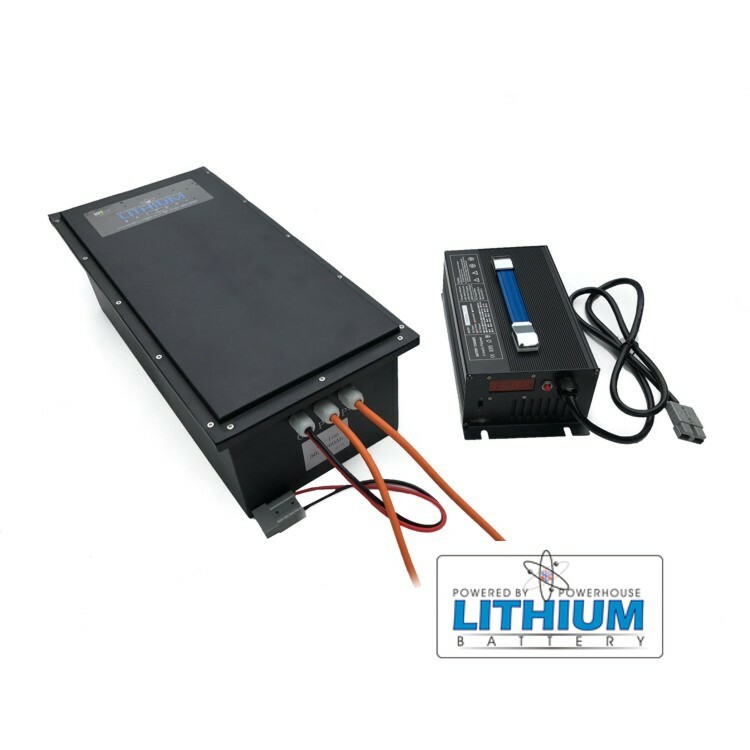 It is supplied with a fully automatic intelligent lithium charger showing charging status. The battery is designed to simply drop in to the battery bay and connect with just one Anderson plug. Also should it be necessary, the battery can be quickly removed and a fresh one dropped in allowing the buggy to return to the course for rental eliminating down time whilst charging. Life expectancy*: In access of 1000-2000 Cycles, unconditional. Duration: 36 hole capacity depending on terrain and conditions. Warranty: This battery comes with 2 years manufacturers guarantee. 24 months from date of purchase, charger has 24 months.